For enquiries about Kenbury Wood please call 01392 834843 or complete the form below. 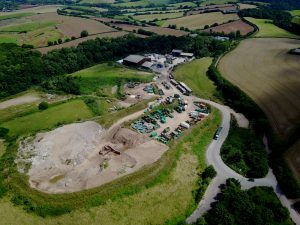 Kenbury wood is DWMHL’s operating base and Inert landfill located just outside Exeter. The site has been in operation for over 25 years, first operating as a small inert landfill and skip operation as part of the Leeses skips. The site has gone through great expansion and investment as part of the group to become the primary waste processing site for construction and demolition wastes (C&D) and dry mixed recycling (DMR). It also serves as our primary operating base for the groups fleet of vehicle and as a Waste Transfer station. Kenbury Wood is the groups primary recycling processing site. The site achieves a combined recycling rate of over 90% of the wastes it processes, materials are mechanically and manually processed to achieve high-quality recyclates which are sold across the recycling market both in the UK and abroad. Kenbury Wood receives thousands of tonnes of construction and demolition materials arising from across the county and region each year. This material is tipped in our C&D transfer station where it is manually picked and then passed through our mechanical separation process to achieve the highest possible levels of recycling diversion. Concrete and Aggregates are separated and stockpiled for processing into saleable aggregates in our crushing and screening area. Kenbury Wood receives thousands of tonnes of commercial and domestically sourced dry recyclable materials each year, the material is processed by our state of the art Material Reclamation Facility (MRF). Paper, Plastics and Metals are separated and baled to produce high-quality materials which are then sold into the UK and global recycling markets. Kenbury Wood runs an aggregate processing operation which processes crushed concrete and aggregates arising from the C&D operation. Materials are processes to WRAP Agrigate protocol standards to produce a saleable aggregate for further use within construction projects. Kenbury Wood is the primary operating base for vehicles forming part of the groups Coastal Recycling, Leeses, Dawlish Skip Hire and Exeter Grab Hire brands.